Here’s a thing: a book about a book. But not just any book of course, it’s ‘the remarkable history of Wisden‘ – the most famous name in cricket writing. 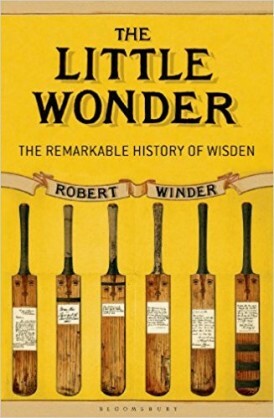 Robert Winder’s remarkable effort traces the story of the famous annual from its modest beginnings as a sideline to John Wisden’s sports equipment business to its undisputed status, more than 150 years on, as the most eminent and most eagerly awaited annual publication in the game, and probably in any sport. A former literary editor of the now-defunct Independent newspaper, Winder is also the author of Hell for Leather: A Modern Cricket Journey. I’m not familiar with that title but I feel I now have to seek it out. He gives few clues about his own Wisden collection, if any, but he writes as someone with a real feel for the game. And as he says in his introduction, the almanack “certainly assumes a keen interest in cricket, but it also (perhaps even more intensely) appeals to the bibliophile, the reader whose first love is books. It is certainly true that the almanack has taken on a more literary quality in recent years – much of the writing is of the highest standard. Almost every notable writer in the game has written for Wisden at one time or another. ‘The Little Wonder’ here has a double meaning of course. John Wisden, known by that soubriquet during his playing days, was a diminutive all-rounder who played for Sussex as well as his own United All-England Eleven. Retiring in his late thirties, he set up a shop in Cranbourn Street in London (near Leicester Square) – itself long gone although a bats-and-stumps logo can still be seen above the fast-food kiosk that now stands in its place. The almanack, which first appeared in 1864, ran to just 112 pages and cost a shilling (oh for a time machine!) and which contained all manner of irrelevant information, appeared as much as anything to publicise the equipment business, to which Wisden devoted most of his time. Advertisements for his products would appear for decades to come in its pages. Although its founder was a proud professional, under editor WH Knight the book soon set out its stall to concentrate on the ‘gentleman’s’ side of the game – the public schools, universities and private clubs. County cricket was in its infancy in 1864, and Test cricket more than a decade away, so the amateur game was very much to the fore – and many would say it would stay that way for a century. Even WG Grace, the superstar of Wisden‘s first forty years, often received faint and somewhat grudging praise for his achievements, the underlying feeling being that there was something rather vulgar about a man who obviously made a good living from playing cricket. Since Knight’s day the annual has been shaped by its editors, and if Sydney Pardon, who oversaw 35 editions (1891-1925) is generally regarded as its greatest editor, a case can be made for Matthew Engel, who did two spells either side of the Millennium, as his runner-up, ahead of the long-serving but essentially conservative Norman Preston. Engel elevated the Notes to something of an art form, and they’re as enjoyable to read today as they were at the time. Tragically he lost his son Laurie to cancer within days of the 2005 Ashes series ending, yet still produced an extraordinary (and best-selling) edition the following spring. You don’t have to be a Wisden reader (or collector, which is not necessarily the same thing) to enjoy this book, but it certainly helps I would think. It has certainly motivated me to go back to my back issues. I have a post-war set and many of them were bought in a short period, roughly between 2007 and 2010 (I discovered ebay, basically) which means that great swathes of the contents remain unread. I also recall that when I was 17 I had a Saturday job which enabled me to buy my own copy for the first time, though I wonder how many of that age will be purchasing it next month. As with many who get the ‘bug’ early, the run has been maintained ever since, though the demands of space in a small and cluttered house grow ever greater, and it’s been some years since I was able to keep all my collection in one room. Last time I wrote here I admitted that I only bought three cricket books last year, of which Wisden, naturally, was one. This is an ideal companion to the famous publication. Martin has informed me that he hasn’t got around to reading it yet – he may want to consider moving it nearer the top of the pile. Because the almanack was inextricably tied in with the sports business for so long there’s a good deal here about boardroom comings and goings – the company was owned at one time by Paul Getty, while before him Robert Maxwell famously threatened to make wholesale changes to the format – and this can test the patience of the reader who wants to get back to the cricket, but this is a minor criticism; Wisden‘s story is very much the story of the modern game, and very little has been left uncovered here. Highly recommended. Local Heroes: the story of the Derbyshire team which won the County Championship. After a hedonistic stay in the Bahamas we are back, and will announce our Book of the Year next week. In the meantime Martin reviews the latest from the ACS Lives in Cricket series.